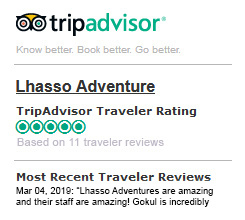 About Us - Lhasso Adventure Pvt. Ltd.
Lhasso Adventure is one of the leading adventure-travel agencies in Nepal. The company was established in 2010 and been running by a team of experienced adventure leaders who has specialized in the Himalayan destinations of Nepal, Tibet, Bhutan and India. Our ethos is to make our guests’ trip exciting, safe and an experience of a lifetime in compensation of their valuable time and money. Safety and ecologically friendly always come to the highest priority for us. Lhasso Adventure has a strong charitable component donating 10% of profits to a charity organisation, Mother and Children Art Foundation. www.mcaf.org.np A non-profit organisation working for the improvement of education, health and employment of impoverished women and children in Nepal. We organize adventure trips for adventure enthusiasts whether they are large, small or just an individual. Duration of trekking and expedition trips can be maximum or minimum as per the requirements of our clients. The Company is affiliated with Nepal Tourism Board, Government of Nepal – Ministry of Culture, Tourism and Civil aviation, Trekking Agencies Association of Nepal (TAAN), Nepal Mountaineering Association (NMA), Kathmandu Environmental Education Project (KEEP), Himalayan Rescue Association Nepal (HRA) and Village Tourism Promotion Forum Nepal (VITOF-NEPAL).